1963. Denver, Colorado. United states of America. In 1963 at the University of Colorado, a little boy named Bennie Solis bled to death in front of Dr. Thomas Starzl’s eyes during the first attempt at a human liver transplant. Four years and zero successful human liver replacement surgeries later (all of the recipients died in less than five weeks), another trial would begin. Young Bennie was surely on Dr. Starzl’s mind when he learned these new liver transplant trials would be supported—like Bennie, all seven patients were children or infants who suffered from diseases that were destined to kill them soon anyway. In his memoir, Starzl, known as the “father of modern transplantation,” writes, “[Letters from these patients’ parents] express thanks for the fact that we had made an effort instead of letting their children die, off in a back room without hope. Those opposed to trying always claimed that these little creatures had been denied the dignity of dying. Their parents believed that they had been given the glory of striving.” In this 1967 trial, though, the children survived, three of them living long enough to show that liver transplantation would have great value for patients in need. It would be another dozen years after Julie’s surgery that the procedure of liver transplantation would become a widespread practice, and another decade after that that Hepatitis C would be discovered, which is the reason for most liver transplants today. 1984. Carnaval. Iguaba Grande. Brazil. The brassy activity of Carnaval is fainter inside the bar. Paulo sips a beer, a cool respite from the heat and bright commotion outside. The alcohol descends over him—a calm settles. He lets out a sigh and takes another sip. “Oi! Paulo!” A man’s voice calls. Paulo turns around and sees a friend of his, smiling. Beside his friend is a woman. She is petite, tan, with short brown hair. She looks as if she’s just come from the beach—her cheeks have a faint blush from the sun, and she has that happy, restful look that the beach always induces. Paulo smiles to his friend and waves, but his eyes return to the woman’s: her oval face, her soft lips turned up in a smile, a smile that is genuine and kind; her eyes, a mix of green blue and brown, with faint laugh lines around them, looking at him calmly and piercingly, but not removed or cold. In fact they are warm, so warm that Paulo feels a flutter of nerves. “This is Solange. Solange, Paulo.” their mutual friend introduces them. She had been relaxing on the beach when the friend stopped by to say hello and suggested they grab something to drink to cool down. The three chat amongst themselves and it is pleasant and easy with lots of laughter. After some time Solange says she must return to her cousin’s house. She is staying there for Carnaval, but she lives in Rio de Janeiro—Paulo says he lives in the city too. “Why don’t you walk her home? I am going in the opposite direction,” their friend says, a smile on his lips. Five years after that chance meeting in Iguaba Grande, Paulo and Solange celebrate their union in a happy ceremony, full of family and friends. They travel the world together: France, Mexico, New York, Miami, Turkey, Portugual and many other places. Paulo works a good job at O Banco Nacional do Desenvolvimento (BNDES) and Solange at an airline. They love living in Rio, they drive around in their Jeep, Paulo’s favorite kind of car. But mostly they love each other. It is a wonderful life. The year Paulo and Solange celebrate their joining together in love, up north in the United States the Hepatitis C virus has just been discovered by CDC investigators. Before that year of 1989, HCV had been known only as non-A, non-B hepatitis and could not be detected in the bloodstream. It would not be until 1992 that a blood test would be created to detect Hepatitis C in donated blood, which means that most contractions of the virus probably occurred during blood donation and blood transfusions. Though by the end of the 90s Hepatitis C in the blood bank was practically eliminated in both the US and Brazil, there was—and is—still a long way to go in terms of raising awareness about the disease itself. It was not until 2012 that the CDC recommended anyone born between 1945-1965, the generations most likely to have been exposed to infected blood, to be tested for the silent disease. A recommendation is not a requirement though, and even many medical professionals are still in the dark about how to identify this slow and deadly disease before it’s too late. August, 2014. Todos os Santos, Rio de Janeiro. Paulo and Solange sit beside each other on the white couch in their 7th floor apartment looking over Todos os Santos, a neighborhood on the north side of Rio de Janeiro. 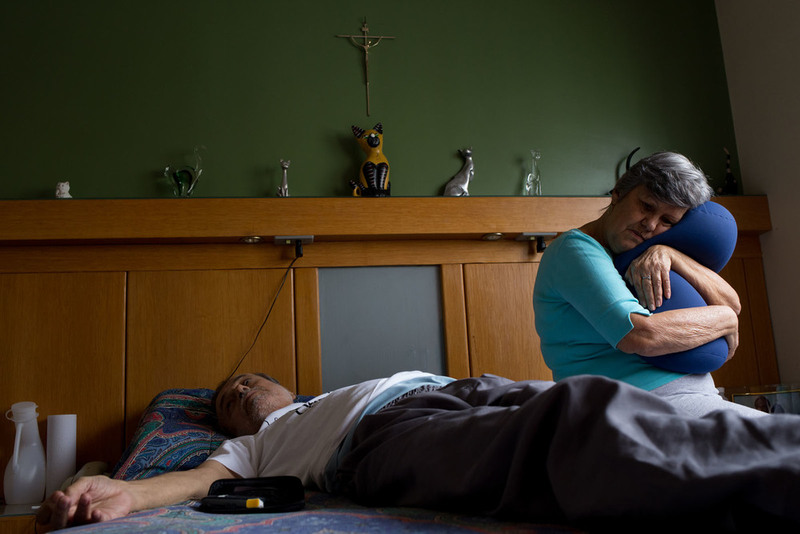 A home nurse checks Paulo’s vitals—something she does 3 times a day every day. They spend much of their time like this nowadays. Solange reaches over to fold down the tag at the back of Paulo’s white t-shirt, leaving her hand on his back for a moment. He turns and smiles at her as the nurse wraps the blood pressure cuff around his thin arm. His shirt reads “Grupo Otimismo,” the two words separated by a colorful grid. They are waiting for Paulo’s physical therapist to arrive, a friendly and charismatic man that does strengthening and mobility exercises with Paulo 5 times a week. Paulo is in the process of recovering from his second liver transplant, performed at Sao Francisco Hospital in March. Hepatitis C first entered Paulo’s and Solange’s world in 2002, when he was officially diagnosed. Paulo had begun to feel tired, unwell. He knew there was something wrong—he felt sick all of the time, like he had a permanent bad cold. He and Solange began to visit doctors, searching for why. Even after seeing 5 doctors, no one could find what was wrong with Paulo. Some doctors even questioned his truthfulness when he described his feelings and symptoms—something many undiagnosed HCV patients encounter in a world where Hepatitis C is only just becoming as widely known as it should be given that some 500 million people globally are living with the virus, the leading cause of liver cancer and cirrhosis. But the doctors questioned Paulo: Was he just trying to get out of work? He and Solange were angry at this assumption. Why would they lie? Why would Paulo want to feel this way? Paulo usually lies down after lunch and he always invites his wife Solange to rest with him. They have been living together since 1989. Although Paulo has a home nurse for most of the day, Solange is always taking care of him and they are very close. The nurses organize Paulo’s daily drug regimen. Each bottle is labeled with the name of the pill and correct time for taking. Solange and Paulo have a maid to help with the housework. At night, they are alone at home and serve their own dinner. In fragile health after undergoing two transplants, Paulo needs a bath chair to take a shower safely. After many unfruitful doctors’ appointments, they began to search for specialists who might be able to better recognize Paulo’s symptoms and perform more specific exams. First they went to an infectologist, then a gastroenterologist, and 3 other specialized doctors. Even though she had to work and was also taking care of her aging mother, Solange went with Paulo to almost all of his appointments. It was a very difficult time, but they were determined. But the day in 2002 that Paulo learned Hepatitis C was the reason for the sickness he felt, he went to his appointment alone. Solange had to be with her mother, but had set up a consultation for Paulo with a rheumatologist because he had been feeling pain in his bones. His hopes were not high for learning anything new about why this was. The rheumatologist examined him like all the other doctors had. Paulo sat quietly. He endured a urine test and routine blood tests. Expecting the same answer—that nothing is wrong, that maybe it is all in his head—Paulo waited. But this time, the results were different. The doctor had found that his aminases levels were strange, and suggested they do a test for HIV, Hepatitis B, Hepatitis C—everything. Until this moment Paulo had not heard of Hepatitis C. He was diagnosed with both strains B and C. The silent virus had struck. His symptoms had shown decades after he was most likely infected—probably the same time he contracted Hepatitis B. There had been so little awareness of this disease in medical communities and the general population alike that none of the doctors he had seen before even thought to do a test for it—even almost a decade and a half after the disease’s discovery. Because patients feel symptoms so late in their lives, they are often in an advanced stage the first time they learn they even have it. As Paulo would soon find out, he was already suffering from cirrhosis. Fear settled over him—Hepatitis C was like HIV right? At least, that’s how people, those who knew about it anyway, seemed to see it at the time. Paulo worried he would be discriminated against. Best to keep it secret, best not to tell his family—and for months he wouldn’t tell them. But Solange, he could, he must, confide in. Solange was out with her mother and sister when she received the call. Her cell phone rang—it was Paulo. Something in his voice seemed wrong when he said hello. After a pause, he told her the results of his doctor’s appointment. All Solange could feel was shock and disbelief. She felt her heart begin to beat faster, her blood pressure rise. She didn’t know what Hepatitis C was but her heart knew it was a bad thing. She had never heard of the disease before, and all of the doctors they had seen seemed to know just as little as them. Though Solange’s shock quickly turned to determination, her anxiety remained. The first obstacle was to find the correct treatment. So Paulo began a series of tests to find what stage of the disease he was at, what state his liver was in. 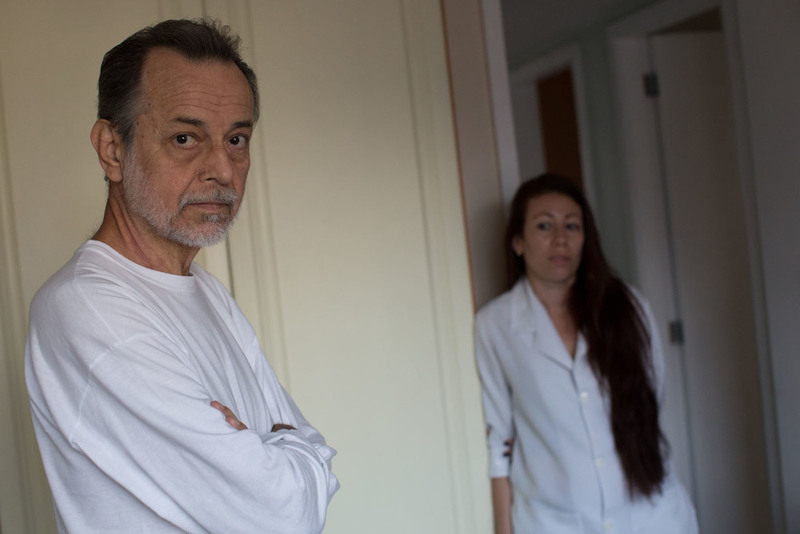 His biopsy was not good—cirrhosis plagued Paulo’s liver. Just these initial tests took a whole year to go through, even with his private insurance. 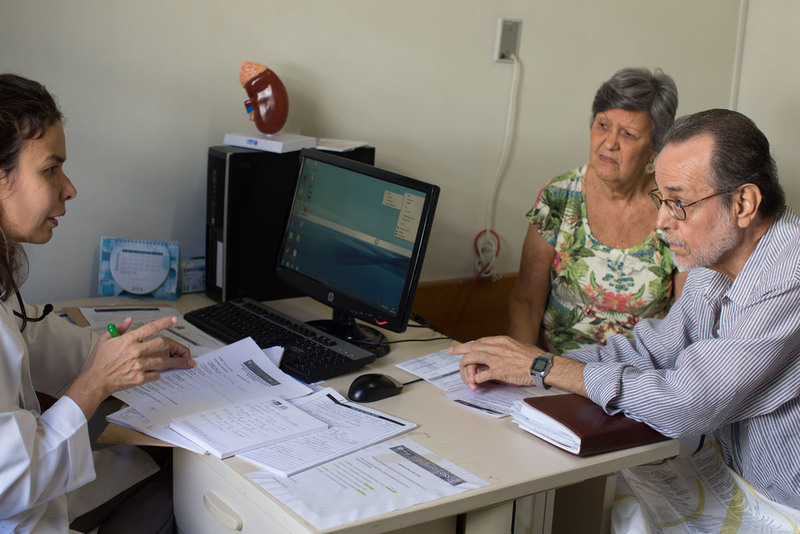 For those who don’t have private health insurance, which is the majority of Brazilians, the initial testing process through the public health system can take much longer—which means that by the time they get to the final stage, the biopsy, their virus could have already progressed to the most acute stages, or even death. By the beginning of 2003, Paulo and Solange began their first attack against the HCV invading Paulo’s body: non-pegylated interferon and a special diet, food that Solange would prepare for Paulo throughout that first year. The application of the interferon consisted of an injection into the abdomen 3 times a week, which Paulo administered himself. Interferon, a protein naturally produced by the body’s immune system, interferes (hence the name) with viral reproduction and triggers the body’s immune response. Non-pegylated interferon is laboratory-made and remains in the body longer. The actual injection was not what worried Paulo—it was what his reaction to the drug might be. He had heard of the terrible side effects most people dealt with. The first injection foreshadowed what would come to characterize his first year of treatment. Within minutes of taking the drug, Paulo began shivering with cold. He covered himself with all the blankets he could find, choking under the weight. He felt he was literally freezing. For two hours he shook uncontrollably under the mountain of covers. When the cold finally began to wear off, instead of feeling relief he began to sweat. His temperature rose and rose, as if he were boiling under a desert sun. He scrambled out of the bed, and stripped himself of his clothes. It was a horrible thing, this first day. The next days he took the injection he would always feel the cold and heat, but nothing like that first day. The organs cannot easily deal with such wild swings of internal temperature—Paulo began to feel pain all over his body as the treatment progressed. But what turned out to be the worst aftermath of the interferon was not the physical side effects, but the mental. He felt he was going crazy. He did not want to speak to anyone, his friends, his family—even Solange. He could not even get himself out of bed—depression overcame him. The days of the injections were the worst. His personality changed, he was not himself—he was anxious, spending barely a moment free of nervousness. He would leave the house inexplicably angry. He’d treat the porteiro badly, the dog—everything. This he could not help. His emotions overcame him. And still the only person other than him who knew why was Solange. For two months, she alone helped bear his pain, reacted to his mood swings with love and understanding. When he was depressed and all he wanted to do was sleep, she would watch TV in the living room, never leaving him alone. While he felt everything imagineable, Solange remained beside him, strengthened by her faith in God and her conviction from years of being a couple that they were stronger together. They each continued working in their respective jobs. Solange kept up her spirits to the best of her ability—but she could not stop the chemical reactions that the stress was causing within her body. The realization that Paulo could really die from this disease, and relatively soon, caused her heart to beat too hard for too long and she developed hypertension. A couple of years later, she would need a pacemaker put in. Yet still, even with Paulo beginning his treatment, both he and Solange felt they knew nothing about this mysterious disease that had so suddenly and insidiously changed their lives. They knew they must confide in others who were in the same situation as they were. Eventually, through their own research, they discovered Grupo Otimismo, a support group in Rio for those living with HCV. Finally, they were surrounded by people with whom they could be open with, people who could understand what they were going through. They saw themselves in others, and their thoughts about the disease—the loneliness of it, the fear, the lack of knowledge, the need for secrecy—began to change as well. Their feelings about their situation were transformed—it was not an awful, all-consuming thing, it would not destroy their way of life even before it destroyed Paulo’s liver. They began to accept the way things stood. Time would go on. Soon after joining Grupo, Paulo and Solange felt the need to give back to their community, volunteering their spare time to raise awareness about Hepatitis C, to help new members of the community learn about treatment, or how to simply cope. They became militants for the cause. And due to his experience with Grupo and new knowledge of his disease, Paulo eventually felt he could tell his family, who, to his happiness, were immediately supportive of him. He eventually garnered the courage to tell his co-workers at BNDES. One day, he brought folders from Grupo that explained what Hepatitis C was to his office and laid them on the desk of every employee in the whole company. Everyone began talking—what was this? What was this thing called Hepatitis C? Some threw the papers out immediately, but more began to read and inform themselves. So when Paulo told his colleagues that he had HCV, they knew what it was. Though a few people were fearful of him, no one treated him so differently, no one stopped talking to him. No one was afraid to touch him. Paulo was lucky—his most important friends stayed close to him. But even though he had such a caring community surrounding him, the side effects of the interferon continued to plague him. Though no one abandoned him, Paulo began to isolate himself because of the depression, anxiety, and anger that overwhelmed him due to the drugs. Solange would try to get him to socialize, but often he simply could not. The interferon had a knife in his back. Pain would not leave his body or his mind. He grew thin, he could not eat. Over time he stopped looking for his friends, and some of them stopped looking for him. A full year went by like this. Then he stopped with the non-pegylated interferon. He was not cured. The laboratory gives Paulo a CD copy of his exams so that he can view them at home. 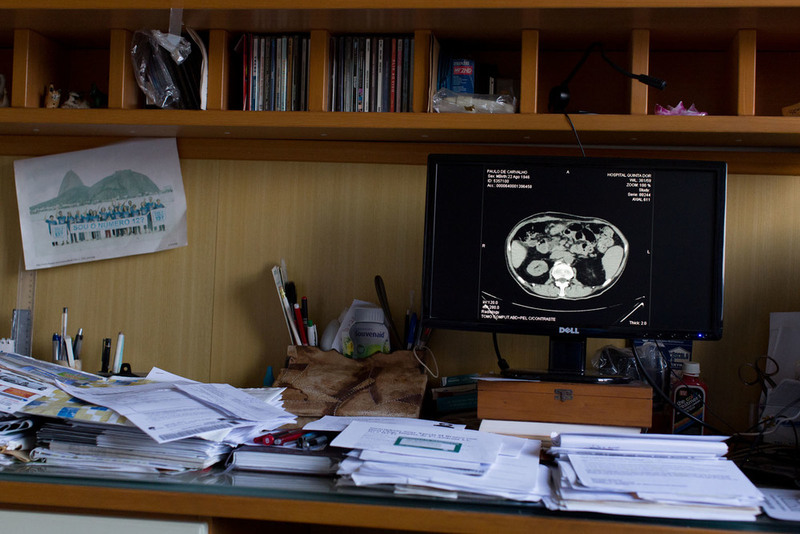 Paulo usually spends his day reading on the computer, analyzing his exams and researching Hepatitis C and other matters relating to the disease. Paulo de Carvalho with one of his home nurses, Helen Aguiar. A few nurses, covered by Paulo’s private health insurance, rotate caring for him throughout the week. Paulo dries his hair with the help of the nurse “J” (“J” did not want to be featured in this project) before going to Hospital São Francisco de Assis for a medical consultation. 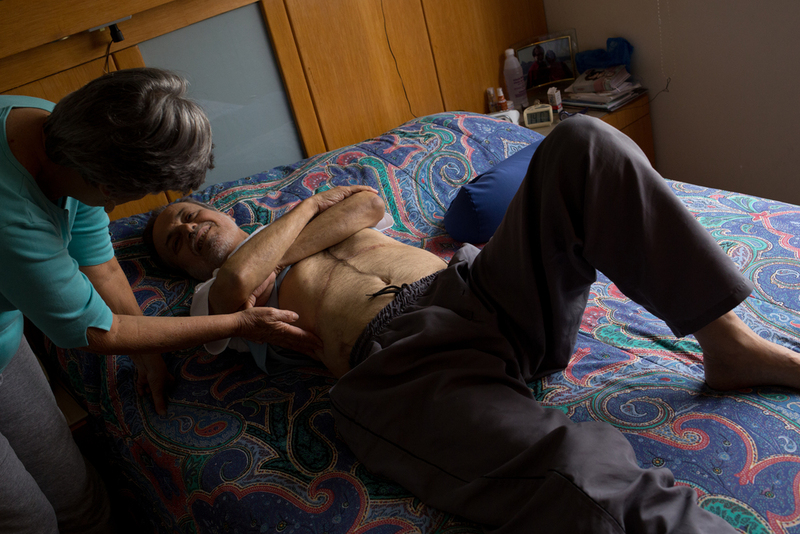 In fragile health after undergoing two transplants, Paulo requires the assistance of a walker. The couple in a taxi on the way to Hospital São Francisco de Assis, located in Tijuca in the north side of Rio de Janeiro. Although Paulo has private health insurance, medical consultations related to his liver transplants must be set up through the public system because surgeries that require donors cannot be granted through the private system. In other words, one cannot “buy” a liver. 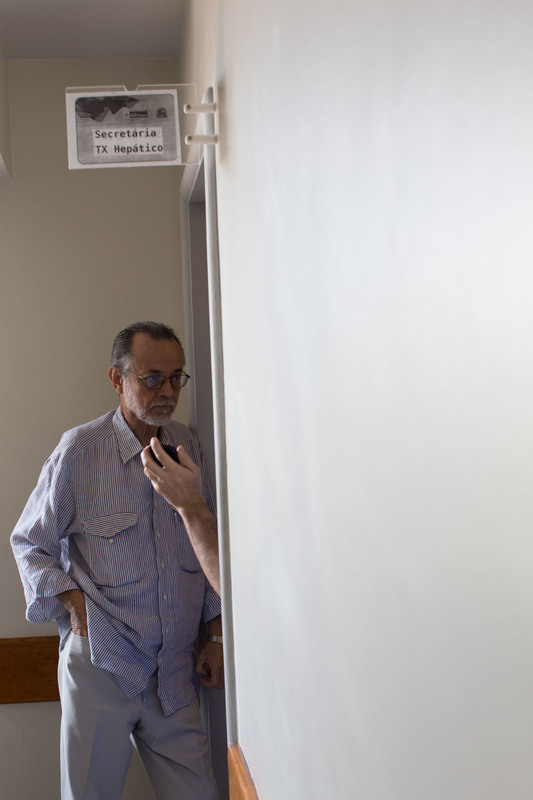 Paulo asks for information about his medical consultation at the Hepatic Transplant Department of Hospital São Francisco de Assis in Tijuca, Rio de Janeiro. Although Paulo has health insurance, medical consultations related to his liver transplant must be set up through the public system because surgeries that require donors cannot be granted through the private system. In other words, one cannot “buy” a liver. Paulo meets the doctor Elizabeth Balbi for his consultation. Solange is Catholic and believes that her faith is a great ally in overcoming the disease of her husband. Here she sits in the church at Hospital Sao Francisco de Assis. After surviving the damaging side effects of non-pegylated interferon, both Paulo and Solange needed a break. After a year off, Paulo tried another strategy of attack: pegylated interferon, a much stronger dose than the non-pegylated so that only 1 injection a week was required, which he underwent at a clinic through his private health insurance. He had received the non-pegylated through the public system and had had to wait in long lines to pick up his medication, and then bring it home to deliver to himself. Over the last year without the interferon, Paulo’s side effects had decreased—he had actually felt pretty good again: not as many mood swings, not as much depression, not as much pain in his body. But the virus was still destroying his liver and if it was not eradicated, he would not live very long. So after a year off, he took pegylated interferon for 6 months, he and Solange once again braving the side effects. Everyone became hopeful that this would be the cure. But after the 6 months had passed, Paulo was still not free of the Hepatitis C. He decided to stop with the interferon—it was not worth enduring the side effects for something that was clearly not working. But one thing had changed—it seemed his cirrhosis had stabilized. It was not getting better, but it was also not getting worse. The day he learned his cirrhosis was stabilized, Paulo stepped out of the clinic feeling more powerful than he’d felt in a long time. He felt like “contando vantagem,” like boasting to the world. He would still need to do an ultrasound every 6 months and an endoscopy once a year, but no more interferon. For now, it was time to celebrate. For a while Solange and Paulo felt like they had their old life back. But things were not as they were—Solange’s mother’s health had grown worse and Paulo was often tired and soon had to retire from his job. Both he and Solange were acutely aware of their privilege—because of Paulo’s job at the BNDES he retired with a good pension that allowed them both to stop working so that Solange could be with Paulo and her mother as much as possible. This was not a usual situation and they knew it—they wanted to give back and upped their volunteering with Grupo Otimismo. During this time, they achieved a certain sense of normality—though Paulo’s energy was not as it used to be, at least he was not having to deal with interferon injections and side effects. Like any other person, he would take regular medicines for headaches or other bodily pains. As grateful as she was for Paulo’s stability, this period remained difficult for Solange as she was split between caring for her mother and for Paulo. Her mother had been diagnosed with Alzheimer’s in 2004. Usually, Alzheimer’s is a slow disease, but it was not so with her mother. In 2006, her mother grew so ill that she had to remain in the hospital. She spent three years there, Solange visiting almost every day. She had always been close with her mother—after all her mother was the first person she confided in when she learned of Paulo’s illness. But every time she left Paulo for her mother, she would feel guilt. It was almost too much responsibility—her mother had returned to a childlike state, crying for Solange in the clinic, refusing to eat unless Solange was there. This along with Solange’s worries about Paulo’s lack of energy took their toll—in July of 2009 Solange had to spend 10 days in the intensive therapy center in Sao Lucas because her blood pressure was up again. Solange left the hospital on a Sunday and the following Friday her mother passed away, her heart stopping while she slept. The day their mother died, Solange’s sister was afraid of telling her due to her recent hospitalization. Her sister called Paulo early Saturday morning, and they all went to the hospital together under the pretense that Paulo was picking up some of his exams that were ready that day, which was also true. When they arrived, Paulo suggested that while they were waiting to get the exams they should check Solange’s blood pressure—after all she had only gotten out of the hospital a week ago. Her blood pressure was a little too high, so the doctor gave her some medicine to lower it and told her to rest. For an hour she rested. Then Paulo and the doctor came in and gently told her that her mother had died the previous night. She was shocked, but the medicines kept the shock from killing her. And then she cried for a long time. Solange slowly became better, coping with her mother’s death and Paulo’s unrelenting illness by creating small art projects as gifts, painting little napkins with whimsical insects or small pots with colorful plants. She would never completely heal after her mother’s death—it is not something one can overcome, but rather absorb and heal over, like a scar. The scars on Paulo’s liver inflicted by Hepatitis C remained unchanged for 4 more years after the passing of Solange’s mother. But in 2013, Paulo was found to have ascites, a condition that occurs when there is high pressure in the liver’s blood vessels and low levels of the albumin protein. It is often caused by long-term Hepatitis B and/or C. Paulo would need a new liver so in early 2013 he entered the line for a liver transplant. His MELD score kept him low in the line, but when the doctors also discovered a tumor in his liver—probably caused by either the Hepatitis B or the interferon treatment he had gone through, but most likely a combination of both—his MELD score gained 20 points and Paulo found himself at the top of the transplant list. Two months later he was at Sao Francisco Hospital about to receive somebody else’s liver. The usual wait time is between 1 to 3 years, so Paulo had a much shorter waiting time than most, but this is not exactly a circumstance that one can describe as fortunate. At 6 am on November 27, Paulo and Solange drove together to the hospital. Solange first left Paulo’s side when the surgery began at 11:30 am. She had followed the nurses as they prepared him for the surgery, but she was not allowed to attend the surgery itself. For the entirety of the operation, Solange prayed in the hospital’s church. When the surgery ended, she watched, scared, as the nurses wheeled Paulo, groggy from the anesthetic, to the ICU. Solange returned home, but she couldn’t sleep. The next day she woke early and went to the hospital, where Paulo was awake and talking. The surgery had been completed, but for nearly a month Paulo would have to remain in the infirmary. On December 23, Paulo came home and he and Solange could enjoy Christmas together. But there was not much rest for them—Solange had to boil all of Paulo’s food to kill any bacteria, she had to make sure he took his medications on time, and sterilize the house and his wounds from the surgery. Her blood pressure would sometimes go up during this time, especially when Paulo was in pain. She worried about his growing thinness. She cherished the times he was able to chat or wanting to go out, the scarce times when he was without pain. But in February of 2014, Paulo began to feel more abdominal pain than usual. 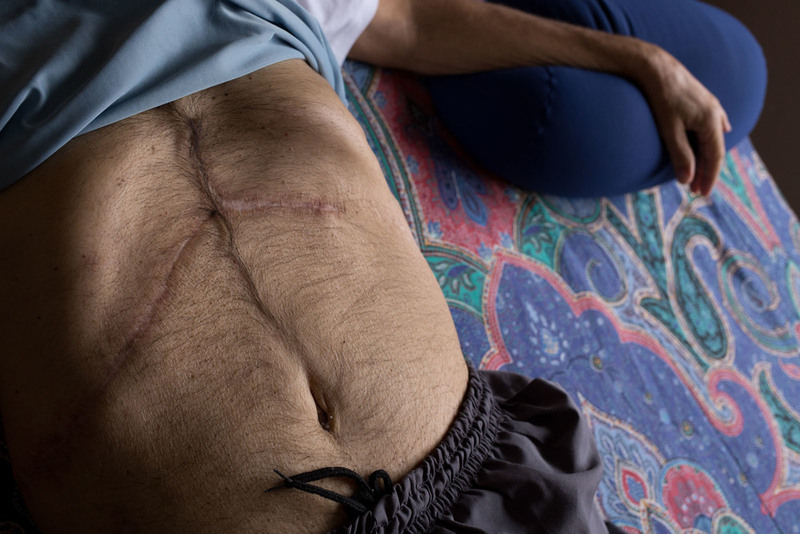 By mid-March the pain had grown considerably worse: it turned out his new liver was leaking bile due to a folding of the hepatic vein, a complication that can arise after a liver transplant. He needed a second transplant and he needed it fast: in less than a week the fluid accumulating in his stomach cavity would deteriorate his new liver to the point of total breakdown. Then at 1:30 a.m. on March 21 a person died and Paulo’s life was saved: a new liver that matched his genotype was available. The transplant began immediately. Solange laid awake for the rest of the night. When the sun was rising fully into the sky the next morning, the doctor called Solange and told her the news—Paulo was okay. And now the story has come to today, a typical day. Solange sits on the white couch while the physical therapist counts slowly, “1, 2, 3, 4” as Paulo lifts his arms up parallel to the ground and then back down with each count. His thin limbs complete the movements gracefully, but with each up and down his face contorts in pain. He breathes through it, looking towards the ground, concentrating hard to finish all of his counts. He goes from arm movements to lifting one leg up and down, balancing on the other. He cannot complete the third set and lets out a large sigh of pain and tiredness as he sits back down in a chair before the next set of leg lifts. Solange serves cake and coffee, her eyes watching Paulo, her face tense and pained as she watches his grimaces. While he does his exercises she talks about their strength together, how always they have been stronger together. Many families are torn apart when a relative is diagnosed with Hep C, but they grew together because in these times they needed each other most. She speaks of how fortunate they are, sitting back down on the soft white couch, offering more coffee, the early evening light from the porch windows illuminating the dining room table set with plates for dinner. Since the first transplant Paulo had not driven, a hobby that he has always loved. But two weeks ago he drove Solange to the beach with the windows open so the warm wind could come through, and he felt no pain. Solange says this with a lightness in her face like that when she described how she and Paulo first met. Their life together as it was before may have ended when Paulo was diagnosed with Hepatitis C—they could no longer travel or do other things they loved to do—but the disease never won. Though it still lurks in Paulo’s veins until the next best treatment option, sofosbuvir, becomes financially accessible, Paulo and Solange will go on, together. After years of union in love, they will officially marry soon. All of the things they’ve been through, the multitude of experiences that have shaped their life though checkered by disease and pain, only strengthened the love and friendship they share. Paulo contemplates a flower in a pot on their balcony, a small and bright red-pink primrose. He speaks of how when you are dying, you see life in a different way, you enjoy the small moments more. Solange joins him on the balcony, resting her head on his shoulder. Rio’s winter air is warm. The following evening is Paulo’s birthday, and Solange has planned a celebration. On the special day, as the sun sets over the city, laughter echoes out from the balcony where the guests sit: Solange, her sister and their friend are at one table and Paulo and his childhood friend, Geraldo, sit at the other. Geraldo and Paulo met here where they grew up in the neighborhood of Todos os Santos. They laugh together like they’re kids again, Geraldo doing most of the talking, a twinkle in his eye, treasuring every word Paulo does speak; Paulo smiling and chuckling in affection at Geraldo’s stories and jokes. Paulo steals glances at Solange every so often, and each time their glances meet they both smile, holding each other’s gaze for a moment longer. Paulo has some friends over to his home to celebrate his 68th birthday. The Home Care service professionals also shared and enjoyed the moment. In this picture, Paulo’s physical therapist (also named Paulo) talks with the couple and a friend of theirs who lives in the same building. Paulo is passionate about cars and has a small collection of old car models. Paulo has some friends over to his home to celebrate his 68th birthday. His best friend, Geraldo, came all the way to Rio de Janeiro to celebrate his friend's birthday. They have known each other since they were children growing up together in the neighborhood where Paulo currently lives, Todos os Santos, in the north side of Rio de Janeiro. One of Paulo’s nurses, Helen, puts eye drops in his eyes to lower the eye pressure caused by his glaucoma. The couple sings happy birthday. Helen celebrates with them. The couple kiss each other after everyone has finished singing happy birthday to Paulo.